Blog | Apala Lahiri Chavan | Global User Experience (UX) in the Future – N=1,R=G? What ICE Ninjas Have to Say! Global User Experience (UX) in the Future – N=1,R=G? What is the future of global ux? This is a question that I have been asking myself for a while now and have not got a definitive answer yet. There are theories, directions, extrapolations, possibilities etc. but the picture is still hazy. However, one fact is clear, UX is indeed the new ‘black’ (http://blogs.hbr.org/cs/2013/01/scaling_your_ux_strategy.html)! It is also the new mantra for differentiation (and hence survival) across the corporate world ( 2012 and 2013 Customer Experience Predictions by Forrester). As an industry insider , this is manna from heaven because it seems like a rather long journey from being looked at the screen beautification folks ( and hence not to be taken too seriously) to a profession that is being perceived as the need of the hour! With the ‘present’ taken care of, we return to the intriguing question,what does the future hold? And, whose future, since there are multiple futures! The UX professional’s future, the client’s future, the user’s future. They all overlap for sure but they also have different perspectives in their expectations from UX. Take, for example, the perspective that UX professionals have regarding the future of UX. 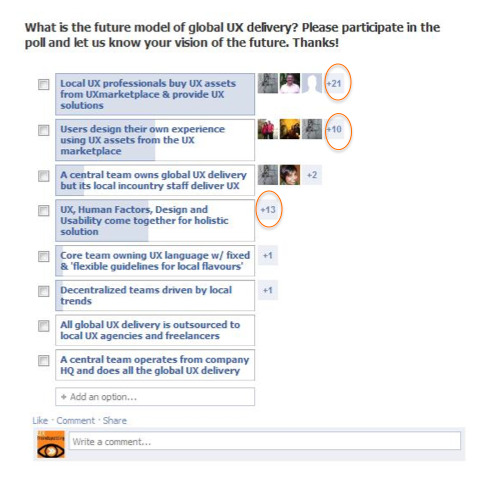 We ran a poll on this topic on our UXTrendspotting page (http://www.facebook.com/uxtrendspotting) a few months back. The most enlightening aspects of the poll response was the realization that the professionals who responded , completely rejected the idea of ‘teams’ of any kind, whether centralized or decentralized! The most votes were for the options that stood for autonomy of UX professionals and users ,where a central marketplace of UX objects (along the lines of an eBay for UX objects) would enable UX professionals and users provide solutions for others and/or themselves. In addition, participants voted for a holistic and unified profession where differing perspectives were well integrated. This vision of the future which entails moving away from corporate teams is very significant. Is this vision driven by the major shift towards democratization in content creation and increased access to global resources that we are experiencing in every walk of life and around the world? A shift that is being made possible because of technology. Are UX professionals asking for the late Prof. CK PRahalad’s N=1, R=G theory to be manifested in the UX domain, in the future ? IF so, how does this ‘future’ vision affect the futures of clients and users? We will talk about that next time. Meanwhile, do write in and share your comments.